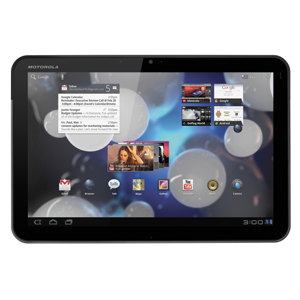 The Motorola Xoom is the first tablet to be sold with Android 3.0 Honeycomb. The 3G version was released in February 2011, and the WiFi version the following month. The Xoom features a 10.1" 1280x800 display with a Gorilla Glass coating. Powered by a 1GHz Nvidia Tegra 2 dual core processor, it also features 1GB RAM, 32GB internal storage, a 5MP camera capable of 720p video recording and micro-HDMI out. The Xoom is driven by a 3250mAh battery with a claimed 10 hour WiFi browsing and video playback.